This is not my dog nor situation but with all the attention this article has gotten and the impression that this information is False because of Snopes.com and other Veterinarians is not entirely True either. What they claim False is this particular story and the fact ice water or an ice cube in moderation is not an issue or an issue on relaxed, cooled dogs. But they do go onto state that the amount of any kind of water can cause an issue or vigorous drinking. I will put parts of the article in bold print to show that the dog wasn’t cooled down and before the ice in water was given, the dog had already drank the bucket of water and a bit later symptoms were noticed. I will also add a link to how to treat a dog over heating. Within that part of the article. Per AKC Canine Health Foundation comment down below, they had stated…. We at the Canine Health Foundation have noticed a lot of internet activity involving this article alerting dog owners to the alleged dangers of giving ice or ice water to dogs. The exact cause of bloat is not understood and to date only risk factors have been identified. It is clear that large-breed and/or deep chested dogs are at higher risk, and it is consensus opinion that these anatomical features may predispose certain breeds to disease. Beyond anatomical features, genetics, feeding practices, exercise, gut motility and stress have been proposed to be associated with development of bloat, but definitive studies are lacking. There have been no studies involving ice or ice water. To better understand bloat, CHF launched a major initiative funding two research teams that aim to identify the underlying mechanisms of the disease. While adding an ice cube to the dog’s water is not by itself a risky situation, a mistake dog owners may be guilty of, is giving cold, icy water to dogs that are over heated or after extensive exercise. Dog owners may feel compelled to quickly cool their dog down and their first thought is often to give them access to cold, icy water. However, this is not the optimal approach. Rather, it is preferable to offer small amounts of water that is cool, not cold, explains veterinarian William Grant in his Dog Heat Stroke Survival Guide . However, when dealing with a heatstroke case, cooling down the dog with cool water is the top priority, whereas hydration is the next. It did not work out that way. After showing we went back to our site/setup and got the dogs in their crates to cool off. After being back about 30 min. I noticed Baran was low on water. https://suite.io/adrienne-farricelli/61qq2q5 I took a hand full of ice from my cooler and put it in his bucket with more water. We then started to get all the dogs Ex’ed and food ready for them. I had Baran in his 48″ crate in the van because this is the place he loves to be. He loves to be able to see everyone and everything. After checking him and thinking he was cooled off enough, we fed him. We walked around and one of my friends stated that Baran seamed like he was choking. I went over and checked on him. He was dry heaving and drooling. I got him out of the crate to check him over and noticed he had not eaten. He was in some distress. I checked him over from head to toe and did not notice anything. I walked him around for about a minute when I noticed that he was starting to bloat. I did everything I was taught to do in this case. I was not able to get him to burp, and we gave him Phasezime. We rushed Baran to a vet clinic. We called ahead and let them know we were on our way. They were set up and waiting for us. They got Baran stabilized very quickly. After Baran was stable and out of distress we transported him to AVREC where he went into surgery to make sure no damage was done to any of his vital organs. I am very happy to say Baran is doing great, there was no damage to any vital organs, and he still loves his food. In surgery the vet found that Baran’s stomach was in its normal anatomic position. We went over what had happened. When I told the vet about the ice water, he asked why I gave him ice water. I said that I have always done this. I told him my history behind this practice and his reply was, “I have been very lucky.” The ice water I gave Baran caused violent muscle spasms in his stomach which caused the bloating. Even though I figured his temperature was down enough to feed, and gave him this ice water, I was wrong. His internal temperature was still high. The vet stated that giving a dog ice to chew or ice water is a big NO, NO! There is no reason for a dog to have ice/ice water. Normal water at room temperature, or cooling with cold towels on the inner thigh, is the best way to help cool a dog. http://goldenretrieverrescueofsouthernmaryland.org/2011/heat-stroke-in-dogs/comment-page-1/ The vet explained it to me like this: If you, as a person, fall into a frozen lake what happens to your muscles? They cramp. This is the same as a dog’s stomach. I felt the need to share this with everyone, in the hopes that some may learn from what I went through, I do not wish this on anyone. Baran is home now doing fine. So please, if you do use ice and ice water, beware of what could happen. I am suggesting that we urge all club members, forward to other clubs, including performance people, grooming shops, veterinarians and anyone else that has a vested interest in dogs, to contact their federal Congressmen/Senators, giving the reasons we are opposed to the recently introduced “PUPS” bill. In addition to the information in Frank’s note, below, here is additional copy/paste material: http://www.saova.org/PUPS.html. Frank’s IRS initiative is ongoing; several congressmen have taken up the cause, personally asking the director of the IRS to investigate the HSUS; now, Frank is asking us to ban together to stop this (HSUS) PUPS bill, which, contrary to another organization’s opinion that we should “let it be” (hoping it would die in committee) is definitely gaining momentum. In addition, there is a huge strategic importance to the issuance of “public condemnation of substandard kennels” (see Frank’s note below). I would like to see parent clubs join the list of organizations that have made such statements. The more organizations that do this, the more fighting power we have against bills such as the PUPS bill. Please have your clubs issue a statement, and note it on their public website. If you will, send it to me, so I can make Frank aware. He is going to use the sheer numbers in his “arguments” for future dialogs with various “powers”. I know this is rather long, but each and every one of us MUST understand what is going on and what needs to be done; so I am providing you with the information; all you need to do is copy, paste and SEND to your federal legislators. PLEASE DO THIS, FOR THE SAKE OF OUR ANIMALS. 1. The number of co-sponsors of the PUPS Bill (H.R. 5434) in the House of Representatives continues to grow each week. As of July 23, 2010 the number of sponsors and co-sponsors in the House of Representatives is 83. 2. HSUS is “beating the drum,” behind the scenes, to Congressional Members and their respective Staffs about the scathing USDA IG Report with regards to APHIS Inspection Procedures, and is citing that Report as a reason for House Congressional Members to co-sponsor the PUPS Bill. 3. HSUS has ballyhooed the Animal Crush Video Bill (H.R 5566), which passed the House on July 21, 2010 by a vote of 416 to only three votes in opposition. Significantly, nearly 300 House Members had co-sponsored this Bill. That is why House Rules on voting for this Bill were suspended. The horrific images used to gather Congressional support for this Animal Crush Video Bill will consciously and subliminally carry over in the minds of many Members of Congress and their respective staffs. 4. HSUS is masterful with its use of subliminal messages and resonating, horrific images that have framed the Public’s “misperceptions” about all breeders. 5. HSUS has spent millions of dollars on advertising on the FOX Network. These ads on FOX raise the following question: Why would HSUS not run the same ads on other major networks, unless there was an ulterior motive? Unquestionably, HSUS is seeking donations as part of its “Factory Fundraising” efforts. However, a secondary and major subliminal purpose of using the FOX Network is to reach out to conservative Republicans, who historically have not scored well on the HSUS Congressional Scorecard. HSUS is politically streetwise and savvy, and it knows that Conservative Republicans are more apt to watch FOX, and “coincidentally” see the HSUS ads, which contain gut-wrenching” images of dogs and puppies. This is done not only to try and gather support for more co-sponsors on the PUPS Bill, but more importantly, to reduce and mute opposition to the inevitable efforts of the HSUS to orchestrate a “Sneak Attack” amendment to a “Must Pass Bill,” such as an Appropriations Bill for funding the USDA. 7. Why would the HSUS use a “Sneak Attack” for the PUPS Bill????????? In March of 2009, during a Workshop sponsored by the Georgetown Law School and the HSUS, Congressman Moran from VA, who was a Congressional Panelist at the Workshop, was asked the following question: “Why is it so hard for us to amend the Animal Welfare Act, and how can we do it? His response was chilling, and the gist of what he said is as follows: The best way to overcome opposition is to wait until the eleventh hour and add a late night, last minute amendment to a “Must Pass Bill,” such as an Appropriations Bill, so that there will be no time for opposition to kill the amendment. Significantly, Congressman Moran is on the Appropriations Committee! Continue to work behind-the-scenes, and “under the radar” to gather co-sponsors for the PUPS Bill by following up with the nearly 300 U.S. Representatives who co-sponsored the Animal Crush Video Bill, and literally “take a license” with these unsuspecting Members of Congress by simply implying that their support is needed for the same reason as was their support for the Animal Crush Video Bill. When the USDA Appropriations Bill comes up for a vote, as Members of Congress are scrambling to wrap up outstanding issues in a hurry so that they may return to their States and Districts to run for re-election, the PUPS Bill will be added, “at the last minute,” and the justification for “expediency” will be that since the PUPS Bill has well in excess of 100 co-sponsors, it “obviously” is not a controversial amendment, and it will become part of a “Must Pass Bill,” and there will be no time to mount opposition to it. 9. Why is this suggested “Sneak Attack” Scenario not only feasible, but likely, you ask? The Congressman who suggested a “Sneak Attack” Approach is Congressman Moran. Congressman Moran co-founded and is the Co-Chair of the Congressional Animal Protection Caucus in the House of Representatives. This Caucus has 84 Members. The Website for the Congressional Animal Protection Caucus lists 40 different animal related Bills “currently under consideration by Congress.” Conspicuous by its absence is the PUPS Bill, which currently is being sponsored and co-sponsored by 83 Members of the House – – that is nearly 20% of the House of Representatives. Could that “omission” be yet another tell-tale indication that a coordinated “Sneak Attack” is on-going, especially since Congressman Moran is the Co-Chair of this Caucus?!?!?!?!?!? Congressman Moran has introduced and sponsored Bills championed by the HSUS. Congressman Moran has been a featured speaker at HSUS Events. Congressman Moran is a Member of the House Appropriations Committee which will be considering the Appropriations Bill for the USDA. o Senator Durbin is in a Democrat Leadership Position in the Senate. o Senator Durbin introduced an identical version of the PUPS Bill in the Senate. o Senator Durbin is on the Senate Appropriations Committee. The HSUS Annual Lobbying Event in Washington DC (Taking Action for Animals) concluded on July 26, 2010 with a Major Lobby Day Campaign, which was totally scripted by the HSUS, and resulted in hundreds of HSUS supporters descending upon the U.S. Capitol to personally tell their respective Members of Congress to support every Bill that HSUS wishes to have Congress enact – – this includes the PUPS Bill! For all of the reasons set out above, I believe the “Perfect Storm” exists for the HSUS to successfully orchestrate the enactment of the PUPS Bill. 1. Is the “perceived problem” and “need” for the PUPS Bill caused by the so-called internet sales “loophole,” or by simply an inability of APHIS to enforce existing laws and regulations? In short, would the “perceived problem” and “need” be best addressed by more strictly enforcing the existing laws and regulations, rather than adding new laws and regulations onto the existing laws and regulations that may not have been strictly enforced? 2. Is it the intent of Congress to mandate that if someone has as few as one intact female dog that is capable of being used for breeding, then that person may be subject to the expanded coverage of the PUPS Bill? 3. Is it appropriate for Congress to define a four-month-old puppy to be an adult dog? 4. Would the existing language in the PUPS Bill have the unintended consequence of dramatically reducing the number of available dogs that are specifically bred and trained for use by special needs organizations that support the handicapped and the blind? 5. Would the existing language in the PUPS Bill have the unintended consequence of dramatically reducing the number of available dogs that that are specifically bred and trained for use by law enforcement throughout the U.S. , the Department of Homeland Security, and the Department of Defense, such as bomb sniffing dogs? 6. Why has the Humane Society of the U.S. , for the last three years, repeatedly refused to tell the American Public and the U.S. Congress that major Pet Breeder Organizations in 10 States have publicly condemned substandard kennels? Significantly, over 85% of all Federally licensed and inspected kennels are located in those 10 States. Micki has amazing structure and comes from an exceptional pedigree. Rowdy was #1 in AKC Breed and All Breed in 2006. He went BOB at Westminster in 2007. Eukanuba BOB 2006 & 2006, and in 2007 also took a Herding Group 3 at Eukanuba. He was also a Specialty BOB winner at the Palmetto Pembroke Welsh Corgi Club & Pembroke Welsh Corgi Club of the Rockies. Again these two have an outstanding pedigree. structure and comes from an exceptional pedigree. Welsh Corgi Club & Pembroke Welsh Corgi Club of the Rockies. with a puppy Herding Group 1, three BOS and a BOW. CH Larklain Rogers Magic Marker “Marker”: His pedigree is stunning, with Honeyfox, Cinonnie, Magnum of Vennwoods and of course, Larklain featured prominently. “Marker” is from one of the very last litters bred by Carol together with her mother Elaine Erganbright. The Larklain kennel name is a chunk of PWC history, started many years ago by the noted breeder Elaine Erganbright, who bred over 200 champion Pembroke Welsh Corgis. She established a line that was noted for its superb temperament and willing disposition as well as conformation that won time and again. 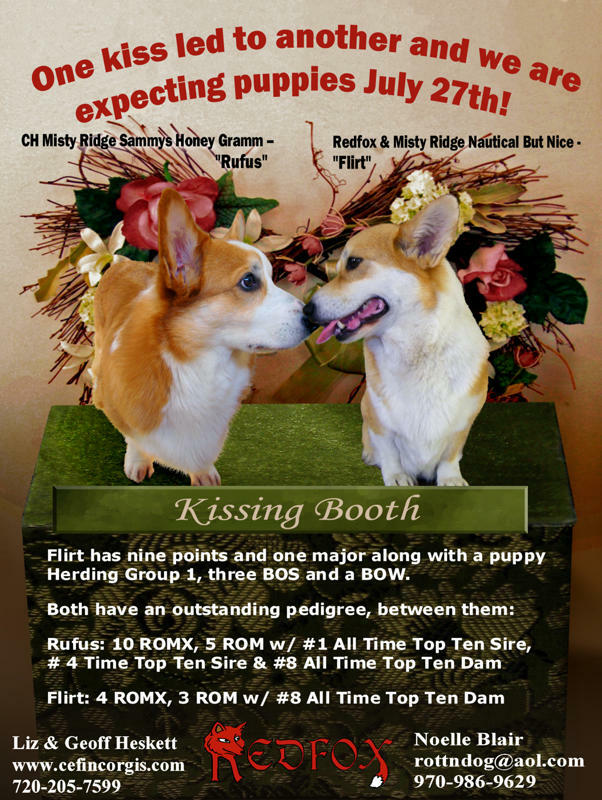 Even after her passing, Elaine is still today one of the top Corgi breeders in the USA. He finished his championship in 2003 with 18 points and 2 majors. Two Major Pet Food Recalls announced July 2, 2010..including Supplements!! you may call the company directly Monday through Friday, 8 a.m.-5 p.m.
For a complete list of the affected pet products, click here.